Eight Richard Petty Motorsports Fords scheduled to compete this weekend at Phoenix international Raceway remain at Texas Motor Speedway today, waiting to be paid for so they can be released to travel to PIR. Reliable sources tell Sirius Speedway that as of 3 PM ET today, the cars sit on an unmarked, white Roush Fenway Racing transporter in a parking lot at Texas Motor Speedway. Alongside sit the respective Richard Petty Motorsports transporters, empty and waiting for permission to load the cars and begin their drive from Fort Worth to Avondale, Arizona. 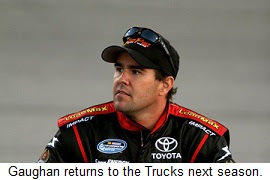 A representative for Richard Petty Motorsports said early this afternoon, “(The transporters) are headed to Phoenix. We’re all scheduled to leave as planned tomorrow morning. Nothing has changed.” Federal regulations allow transporter drivers to drive for only 10 hours before getting 10 hours of rest. It is approximately 18 hours from Texas to Phoenix, and teams are required to sign in at the track at 7:45 AM ET (5:45 AM local) on Friday. 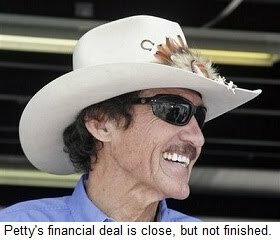 Richard Petty Motorsports employees have been required to work on their cars at Roush Fenway Racing in recent weeks, since Roush will not release the cars until they are paid for. RPM faces other financial obligations in the near future. The team is scheduled to make winnings and retainer payments to each of its drivers on the 15th of this month. UPDATE: RICHARD PETTY MOTORSPORTS TOOK DELIVERY OF ITS PHOENIX CARS JUST AFTER 3 PM ET WEDNESDAY, AND ITS TRANSPORTERS ARE EN ROUTE TO PHOENIX INTERNATIONAL RACEWAY. A few years ago, former Joe Gibbs Racing driver Tony Stewart was called on the carpet by his team and its sponsors after squandering a potential win with one of his infamous piques of temper. Stewart’s team reportedly took a vote that week on whether to retain him as driver, and then-sponsor Home Depot informed him – in no uncertain terms – that his conduct was unacceptable and had to change. Perhaps it’s time for someone to have a similar “Come To Jesus Meeting” with Kyle Busch. Busch’s car was fast enough to win Sunday at Texas Motor Speedway. He wasted little time overcoming a 29th-place qualifying effort, running as high as third before a piece of debris lodged in his front splitter and forced him to drop back. Busch then spun out on lap 160, and got busted for speeding while trying to avoid losing a lap to the pace car on pit road. 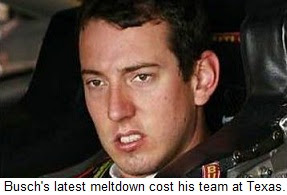 That’s when it all came unglued, as Busch’s hair-trigger temper once again short-circuited his team’s chances for victory. He erupted in a storm of expletives when informed of the penalty; a four-letter tirade that prompted NASCAR to summon him to pit road for further consultation. 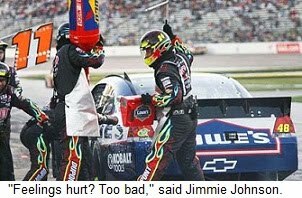 He then made a bad situation even worse, making an obscene gesture to a NASCAR official and earning a two-lap “unsportsmanlike conduct” penalty from the sanctioning body. 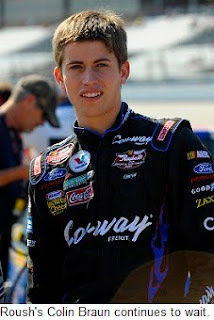 A fast race car was not enough for Busch to dig out of his self-inflicted hole, and he finished the race two laps down in 32nd place; his third finish of 30th or worse in the last four events. The driver that many predicted to win the 2010 Sprint Cup championship has now finished no better than 13th in the last six Chase races, plummeting to seventh in points. 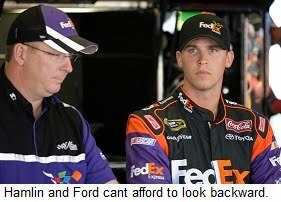 His second playoff meltdown in as many seasons comes as his teammate, Denny Hamlin, uses similar physical skills and a far-superior mental outlook to contend for the championship. Busch’s latest collapse raises valid questions about whether one of the best pure wheelmen in the history of the sport possesses the mental toughness needed to contend for anything more than race wins. When it comes to winning championships, handling pressure is as important as handling an uncooperative race car. All the car control in the world won’t make up for a lack of self control by the driver. Busch’s volatility is both his best and worst quality. 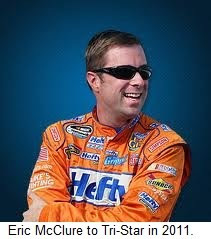 His unwillingness to accept anything but first place has driven him to become the multi race-winning driver he is today. His propensity for coming unhinged at the first sign of adversity, however, prevents him from accomplishing anything more significant than that. Busch may face additional penalties later this week. NASCAR Director of Communications Kerry Tharp made it clear that the sanctioning body will not allow its officials to be disrespected the way Busch did Sunday. Kyle eventually apologized for his actions, saying, “I'm sorry… to everybody on this team, to everybody at NASCAR and all of my guys that support me.” Unfortunately, that apology came long after the damage was done. 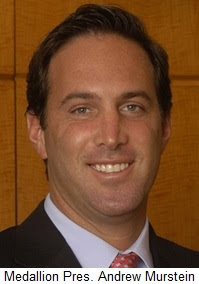 Team President J.D. Gibbs spoke to the media after Sunday’s race and said it was time for Busch to begin controlling his emotions. “I think that's something that he's going to have to continue to work on,” said Gibbs. “I think he acknowledges that. But right when it happens, it's hard for him to control. That’s an area… in life he's going to have to address. We've got to make sure it happens sooner rather than later." Hopefully, Gibbs will make similar comments – in considerably stronger terms – to Busch in the next few days, putting him on a path to eventually fulfill his enormous potential. For the first time in his nearly five-year run at the top of the NASCAR Sprint Cup Series standings, Jimmie Johnson’s mettle is being tested to the limit. That much was clear Sunday night at Texas Motor Speedway, as Johnson’s over-the-wall pit crew made mistake after mistake in the heat of a red-hot championship battle, before being replaced by Jeff Gordon’s Dupont Chevrolet team. With Gordon out of the race following a bizarre yellow-flag crash with Jeff Burton – and the spirited shoving match that followed – crewchief Chad Knaus pulled the trigger on a move unprecedented in the history of NASCAR. 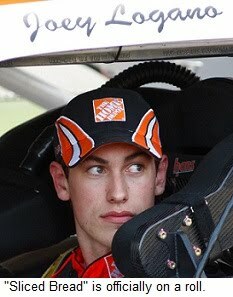 He benched his bumbling over-the-wall gang, bringing in Gordon’s tire changers for the remainder of the race. The move was effective to a degree, as the 24 team performed flawlessly on its final three pit stops and allowed Johnson to rebound for a ninth-place finish at day’s end. The karmic damage done to the once-unbeatable Lowe’s Chevrolet team, however, has yet to be assessed. "At this point in the game, you can't have feelings," said Johnson, who left the Lone Star State 33 points behind Denny Hamlin with just two races remaining. "If somebody's feelings got hurt, too bad. We're here to win a championship, and we have to do everything we can." 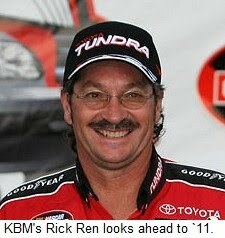 Crew swaps happen all the time in NASCAR. Richard Childress Racing moved Clint Bowyer’s team to the Kevin Harvick pit a few weeks ago to address a similar lack of pit road performance. But that move happened at mid-week, not mid-race. Nobody got fired on national television, and nobody was forced to stand and watch while replacement players took over their job in the biggest race of the season to date. 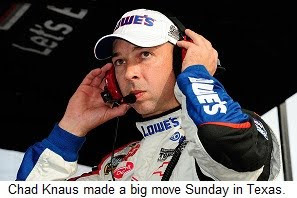 "It's a professional sport, and you see it all the time," explained Knaus. "If somebody's… not getting it done in football, you get a different receiver in the game, or a different quarterback. Our guys weren't hitting on all eight cylinders and we had an opportunity to bring those guys in. They came in and played relief, and I thought they did a good job. It's unfortunate. I don't like doing that stuff, nobody does. But it's kind of your job." Others, however, saw the move as a sign of weakness, a panicky, desperation move by a team unaccustomed to having to play from behind when the chips are down. 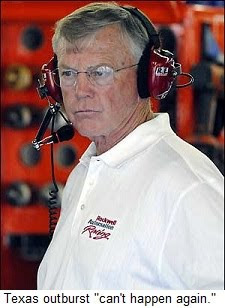 "You put the two pit crews toe-to-toe, and those guys are going to make mistakes," said Fed Ex Toyota crewchief Mike Ford, who long ago identified Johnson’s pit road issues as a weakness to be exploited. Ford intentionally chose the pit stall next to Johnson Sunday, hoping the pressure of performing head-to-head would cause the 48 team to fail. “We've seen it this year, and we (intentionally) went beside them,” said Ford. 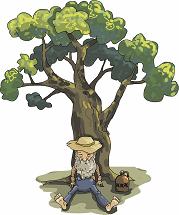 “Those guys faltered, and it made them panic and push to the point where they made changes. For his part, Johnson said his bottom line is performance, hurt feelings be damned. "I'm not sure what the implications are going to be (back at) the shop," he said, "but we've been lacking and we needed to get it straightened out. I really do care for these guys from the bottom of my heart. They're my guys, (but) we have to perform. We can't come down pit road and lose 10 spots every stop. That's just killing us. "The alarm clock's been ringing for quite a few months." No one knows what decisions will ultimately be made, or who will man the air guns this weekend at Phoenix International Raceway. Some members of Johnson’s crew have been together for all four championship seasons, forging a battle-tested camaraderie that – until Sunday – seemed utterly unshakeable. That’s all changed now, no matter who jumps over the wall at Phoenix. 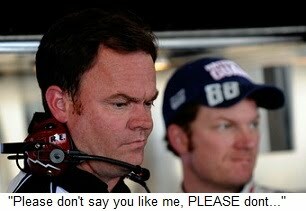 Unconfirmed reports had tire changer Mike Lingerfelt leaving the track in anger immediately after the move. For others, the palate of emotions ranged from anger to embarrassment to concern for their jobs. The unbeatable, unassailable Team 48 was rocked to its core Sunday by a move Ford called, “more about trying to win a championship for the company (than for) the team.” Its image of invincibility has now been shattered, leaving only unanswered questions about how they will respond. "We'll find out," said Johnson. "I've got no clue. It's unchartered territory for us." 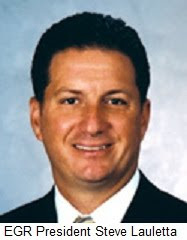 Earnhardt-Ganassi Racing President Steve Lauletta confirmed to Sirius NASCAR Radio’s Sirius Speedway with Dave Moody that EGR will remain in the Chevrolet camp in 2011 and beyond. Lauletta also said he is “not anticipating any changes” on Jamie McMurray’s #1 team next year, including driver, sponsor and crewchief. 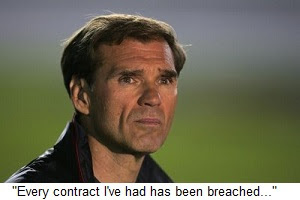 Richard Petty Motorsports minority owner Ray Evernham confirmed today that Petty is assembling the financing necessary to bid for control of the troubled team, and said he will do whatever he can to ensure the success of that venture. One of the team's drivers, Stanley Tools Ford driver Elliott Sadler, said news of Petty’s involvement has helped calm fears among team employees about the future of the company. 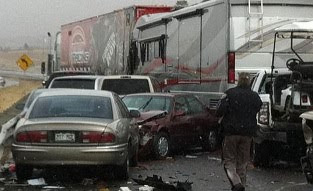 “I think people were more scared at Martinsville than they are now," said Sadler. 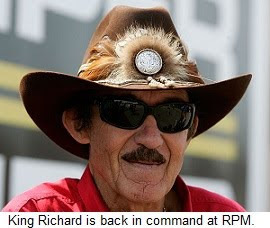 "Richard Petty has gotten a lot more involved in the last couple of weeks and that has put people at ease. I’m confident that we’re going to be here for the remainder of the season. By Popular Demand: The Godfather's World Famous Apple Pie Moonshine Recipe! Strain through cheesecloth or paper towels into mason jars or other container. 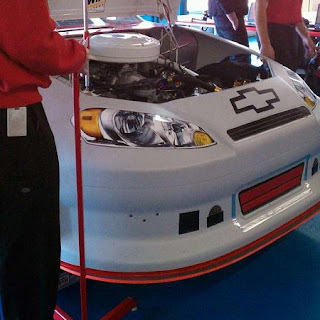 Juan Pablo Montoya tweeted this picture of the new, 2011 nose on his Target Chevrolet during testing this week. Slick, clean and with no ugly metal braces. 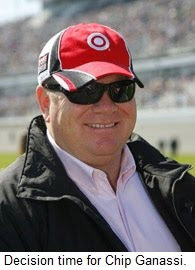 Expect a decision on Earnhardt-Ganassi Racing’s possible move from Chevrolet to Ford by the end of this week. 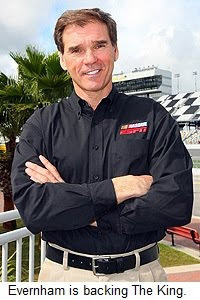 Sources with the team say that Ford’s offer is better financially than what Chevrolet can provide, but that Jamie McMurray’s wins in this year’s Daytona 500, Brickyard 400 and Bank Of America 500 at Charlotte were due in large part to the dominance of Earnhardt-Childress Racing Engines. 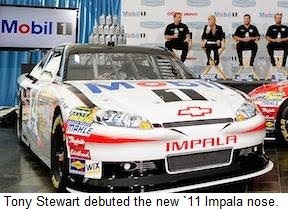 The NASCAR Sprint Cup Series will have a new look in 2013, emphasizing brand identity in much the same way the NASCAR Nationwide Series does with its new cars. Sirius NASCAR Radio's Sirius Speedway with Dave Moody has learned that all four automakers have already begun work on the new cars, after obtaining NASCAR approval for more points of similarity between their street cars and the NASCAR versions. The automakers have already submitted drawings of their proposed 2013 NASCAR Sprint Cup Series racers to the sanctioning body for preliminary approval. A number of revisions are expected, as NASCAR seeks to balance its desire for brand identity with the need for a common aerodynamic footprint between brands. In a related story, Dodge’s new 2011 Sprint Cup Series nose has now been approved by NASCAR, leaving only Ford Motor Company awaiting final approval. The new pieces are smoother and more aesthetically pleasing than the current splitter-based assemblies, with a single, molded piece replacing the two-piece splitter/bumper combination and its cumbersome metal braces. 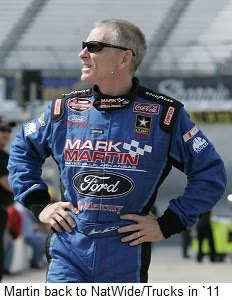 Ford is expected to have its new nose approved shortly, with implementation at SpeedWeek 2011 in Daytona.